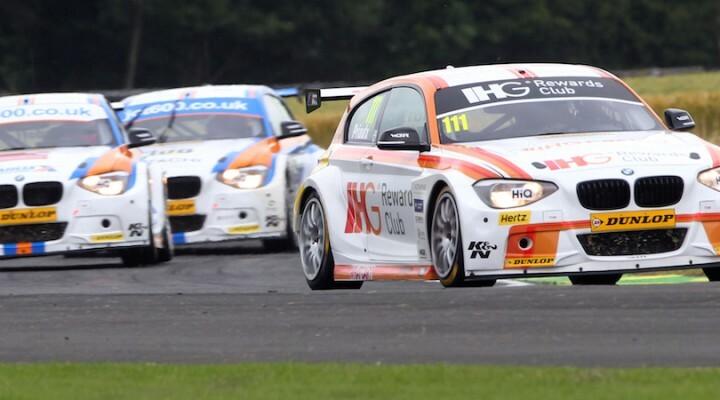 West Surrey Racing scored a sensational 1-2-3 finish in the opening Dunlop MSA British Touring Car Championship race at Croft as Andy Priaulx led home team-mates Sam Tordoff and Rob Collard. With only Gordon Shedden’s Honda preventing the BMW trio from starting the race in the top three positions it didn’t take long for Collard to steal an advantage over the Civic Type R to follow his stablemates line astern. Pole-sitter Tordoff led into turn one from Priaulx and Collard and looked comfortable out front for much of the early running. The JCT600 with GardX driver had pulled a gap of more than eight tenths of a second by the end of lap five as rain began to fall on the North Yorkshire circuit. The defining moment came shortly after as Tordoff made a slight mistake at the chicane on the now greasy surface and Priaulx nipped through to head the field. The rain eased almost as quickly as it had started and the three drivers settled into position for the remainder of the race. Collard dropped away late on, into the clutches of Shedden’s Honda, as the soft compound Dunlop SportMaxx tyres lost performance. Tyre choice had an impact on the battle for fifth too, which was initially held by Rob Austin. The Exocet Audi driver made a storming getaway from seventh on the grid before running side-by-side with Colin Turkington’s VW for the first few turns. Austin prevailed early on but their battle would be short lived with both drivers choosing to run the soft tyre in the opener. Turkington repassed Austin on lap six but as he too began to fade with a boost pressure problem it was left to Matt Neal and Andrew Jordan to fly past and claim fifth and sixth respectively. Jordan’s MG was made to work extremely hard for position as he was initially held up by his soft-shod team-mate Jack Goff. An eye catching move by him was followed by two further stellar efforts past Austin and the battling Toyota Avensis of Tom Ingram. Reigning champion Turkington fended off Ingram to hold seventh, whilst Adam Morgan’s Mercedes relegated Goff’s MG down to tenth in the closing laps. Team BMR’s Aron Smith finished just outside the top ten but came out on top of a scrap with rookie Josh Cook. Smith’s VW made rather heavy contact with the Chevrolet Cruze on the exit of the chicane on the final lap and was able to squeeze through as Cook regained his composure. Both BTCC debutants put in solid performances away from the top order, with Support our Paras driver Max Coates impressing. The local racer finished 21st, ahead of his team-mate Derek Palmer, while AmDTuning’s Nic Hamilton enjoyed a trouble-free run to 25th. Last of the finishers was double champion Jason Plato who pitted at the end of the green flag to change tyres. The plan was to sacrifice race one in order to set a fast lap, and ultimately good grid position, for the second bout later this afternoon. The decision may have cost him points of course but he will start race two from third after clocking a decent early lap. Tordoff will be on pole for the second time as he’ll look to fend off Priaulx while Plato starts alongside new championship leader Shedden on row two. Honda Yuasa Racing now holds a one-two in the drivers’ standings but Neal has it all to do next time from 13th on the grid. The second contest commences at 14:30 and will be screened live and in high definition on ITV4.